A 72-year-old male arrives to the ED in respiratory distress. EMS reports that he is hypoxic with a cough and fever, had no improvement after albuterol, and is now on CPAP. As he is rushed into the room, you note the pause from everyone at the workstation as it’s clear he is now the sickest person in the department. He looks more altered as he pulls at his mask and starts to fight for air. As he is moved off the stretcher, you grab your airway setup and a new set of vitals reveals a BP of 78/50 mmHg. What’s your next move? Do you move forward with the intubation, hoping for a quick first- pass success and deal with the blood pressure later? Start running some fluid “wide open” as you push the RSI medications? Or is there a better way to optimize this patient as quickly as possible to secure the airway and prevent turning your critical patient into a coding one? In the ED and ICU, peri-intubation hypotension occurs frequently and correlates significantly with morbidity and mortality. Hypotension is an independent risk factor for cardiac arrest, and studies of intubations in critical care patients note an incidence of severe cardiovascular complications of up to 30%.1-4 While the pathophysiology of shock is often multifactorial and complicated by the patient’s underlying illness, the series of actions taken during intubation can abruptly alter or overwhelm the patient’s already tenuous compensatory mechanisms. For example, the introduction of positive pressure ventilation (PPV) can decrease venous return, preload, and cardiac output.5 In addition, circulating endogenous catecholamines helping to maintain cardiac output and vascular tone can be rendered ineffective by rapid pH drops (from respiratory acidosis) and the sympatholytic effects of induction agents.6,7 Many of these factors are inherently unavoidable as we can’t always prevent respiratory failure in patients in shock. Therefore, every effort should be made to rapidly resuscitate the patient immediately to prevent further decompensation and cardiovascular collapse. In particular, the percentage of patients receiving a fluid bolus improved from 49% to 75% and was identified by the authors as having played a key role in improving hemodynamics in the intervention group. As previously discussed in our blog on rapid resuscitation, a rapid fluid bolus can effectively treat hypovolemia and intravascular depletion while augmenting preload to buffer the sudden addition of PPV. In the case of the 72-year old male described above, this patient needs resuscitation prior to intubation. The presence of hypotension confers a 10-fold increased risk of death during hospitalization and every minute of continued hypotension leads to tissue ischemia that increases risk of organ dysfunction and death.11,12 In the ED, we often face the sickest patients that require immediate action with little or no time to prepare. EMS may have placed an IV, but that is not always the case. Inserting a central line or waiting for a vasopressor drip to come up from pharmacy could be out of the question if they are decompensating. Push-dose pressors are an option, yet not all ED’s or providers are comfortable with their use.13,14 In reality, especially in the community setting, the go-to intervention will be fluids. Yet how effective are current fluid delivery methods for rapid resuscitation? Gravity infusion or hanging saline “wide open” is a passive intervention. It may eventually fix the blood pressure, but the delay will prolong the duration of respiratory distress and increase the risk of organ injury. Lifeflow® is a new method to facilitate rapid, controlled fluid resuscitation. Studies have shown that LifeFlow can deliver an initial 500ml fluid bolus in 2.5 minutes, significantly faster than any traditional method.15,16 LifeFlow can enable clinicians to quickly restore perfusion and see immediate improvement in patient’s heart rate, blood pressure and other measures of shock. As discussed previously in the Dangers of Passive Resuscitation, time is essential in the treatment of a hypotensive patient. We know that intubating a hypotensive patient confers significant risk of hemodynamic collapse and cardiac arrest. Innovative new techniques, like LifeFlow, may offer us the ability to quickly resolve peri-intubation hypotension with minimal interruption as we’re setting up to secure the airway. Interested in learning more about LifeFlow? Contact us. 1. Heffner AC, Swords DS, Neale MN, Jones AE. Incidence and factors associated with cardiac arrest complicating emergency airway management. Resuscitation. 2013;84:1500-1504. 2. Kim WY, Kwak MK, Ko BS, Yoon JC, Sohn CH, Lim KS, Andersen LW, Donnino MW. Factors associated with the occurrence of cardiac arrest after emergency tracheal intubation in the emergency department. PLoS One. 2014;9:e112779. 3. Perbet S, De Jong A, Delmas J, Futier E, Pereira B, Jaber S, Constantin JM. Incidence of and risk factors for severe cardiovascular collapse after endotracheal intubation in the ICU: a multicenter observational study. Crit Care. 2015;19:257. 4. Schwartz DE, Matthay MA, Cohen NH. Death and other complications of emergency airway management in critically ill adults. A prospective investigation of 297 tracheal intubations. Anesthesiology. 1995;82:367-376. 5. Manthous CA. 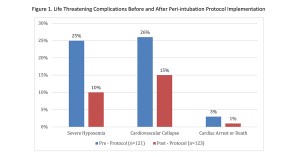 Avoiding circulatory complications during endotracheal intubation and initiation of positive pressure ventilation. J Emerg Med. 2010;38:622-631. 6. Andersen MN, Border JR, Mouritzen CV. Acidosis, catecholamines and cardiovascular dynamics: when does acidosis require correction? Ann Surg. 1967;166:344-356. 7. Stollings JL, Diedrich DA, Oyen LJ, Brown DR. Rapid-sequence intubation: a review of the process and considerations when choosing medications. Ann Pharmacother. 2014;48:62-76. 8. De Jong A, Rolle A, Molinari N, Paugam-Burtz C, Constantin JM, Lefrant JY, Asehnoune K, Jung B, Futier E, Chanques G, Azoulay E, Jaber S. Cardiac Arrest and Mortality Related to Intubation Procedure in Critically Ill Adult Patients: A Multicenter Cohort Study. Crit Care Med. 2018;46:532-539. 9. Weingart SD, Trueger NS, Wong N, Scofi J, Singh N, Rudolph SS. Delayed sequence intubation: a prospective observational study. Ann Emerg Med. 2015;65:349-355. 10. Jaber S, Jung B, Corne P, Sebbane M, Muller L, Chanques G, Verzilli D, Jonquet O, Eledjam JJ, Lefrant JY. An intervention to decrease complications related to endotracheal intubation in the intensive care unit: a prospective, multiple-center study. Intensive Care Med. 2010;36:248-255. 11. Jones AE, Yiannibas V, Johnson C, Kline JA. Emergency department hypotension predicts sudden unexpected in-hospital mortality: a prospective cohort study. Chest. 2006;130:941- 946. 12. Marchick MR, Kline JA, Jones AE. The significance of non-sustained hypotension in emergency department patients with sepsis. Intensive Care Med. 2009;35:1261-1264. 13. Panchal AR, Satyanarayan A, Bahadir JD, Hays D, Mosier J. Efficacy of Bolus-dose Phenylephrine for Peri-intubation Hypotension. J Emerg Med. 2015;49:488-494. 14. Weigand S, Hedrick JN, Brady WJ. The use of bolus-dose vasopressors in the emergency department. Emergency Medicine. 2018;50:72-76. 15. Brooks EA, Piehl M. Potential mortality and cost reduction in adult severe sepsis and septic shock through the use of an innovative fluid delivery device. Open Access Emerg Med. 2018;10:165-170. 16. Piehl M, Spangler H, Robertson G, Chenet K. A Novel Technique for Improving Fluid Resuscitation in Septic Shock. Annals of Emergency Medicine. 2017;70:S150.